If you’re not too nervous about crossing the border from Canada to the United States, you may notice a captivating scene ahead of you. Just beyond the border patrol check point in Blaine, Washington, an airy assemblage of black sticks seem to be forming a rectangular, three-dimensional frame through which you may view the country you are about to enter. The top of the frame is open and gives the appearance of motion. Depending on your perspective you may believe the rectangle is coming together or dispersing into its thousands of requisite parts. The strong but delicate structure gives you sense that that it is floating and begins to blur the line between reality and imagination. 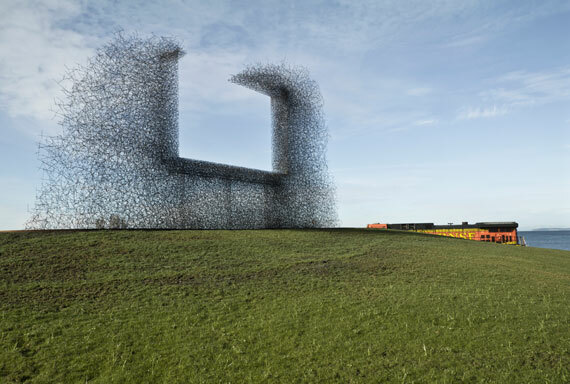 Catching a fleeting glimpse of Lead Pencil’s work at the border is inspirational. View from the border borrowed from the Stranger. You would then think that getting an installation from this Washington duo would prove equally enticing. 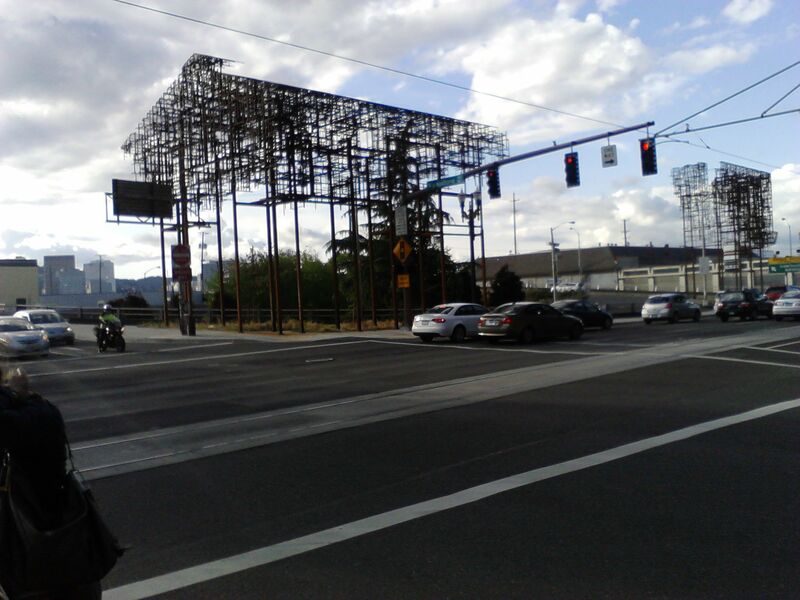 Standing at the base of two of Portland’s busiest downtown bridges, Lead Pencil used thick, rusty iron rods to create structures that evoke the roofline industrial buildings that once lined the area. The casual observer would notice this if the pieces were placed in a location where one could actually take the whole thing in. 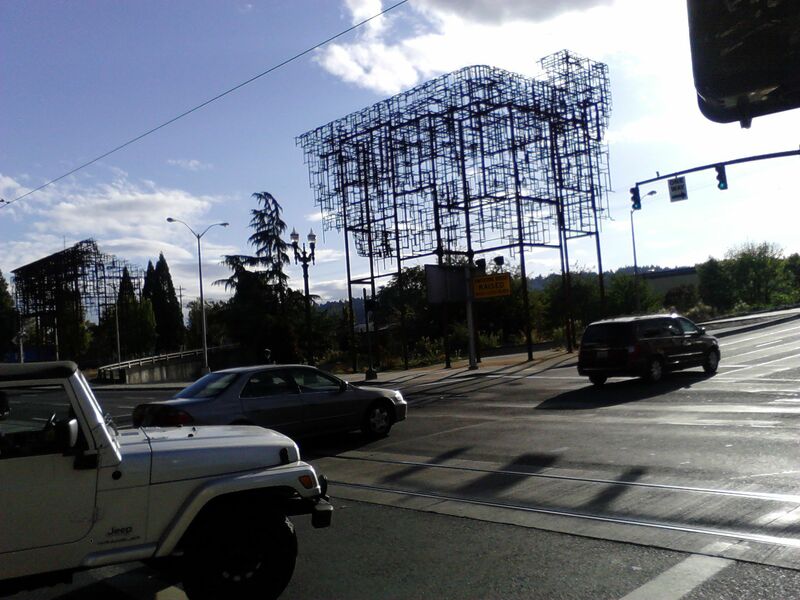 Alas, they stand more like forgotten, rotting infrastructure off to the side of a busy road, trapped between two bridge on-ramps, mostly out of the line of sight of passing motorists. Their orientation discourages interaction by facing away from the action. If you take the time to view them by foot, you get a better sense of their shape, but they lack the finesse of earlier installations. Instead, the structures loom overhead and give the impression that they might be sinking rather than rising or stretching towards some greater purpose. Unfortunately this effect seems incidental. There are no iron rods littering the ground or appearing to droop from above. Instead the pieces tower like infrastructure, past its prime. I admire Lead Pencil’s decision not to romanticize the buildings of the past, however given the budget and prominent location, I expected something more. Perhaps their message is that not everything from the past is good and that these figments from the past are reminding us that some buildings really are best forgotten.